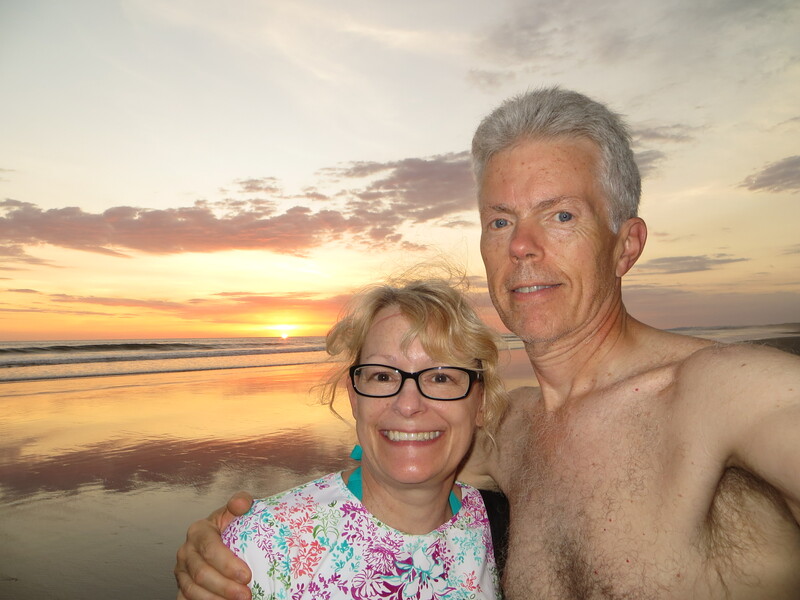 A couple times a week, we drive to the beach called Playa Linda in the late afternoon. It’s not a far ride, maybe 10 minutes. We have been lucky and the tide has been all the way out. The wet sand is hard, which makes a nice flat walking surface. We usually walk about three miles or so. While walking, we have noticed really pretty and interesting designs in the wet sand. They are made by small crabs. 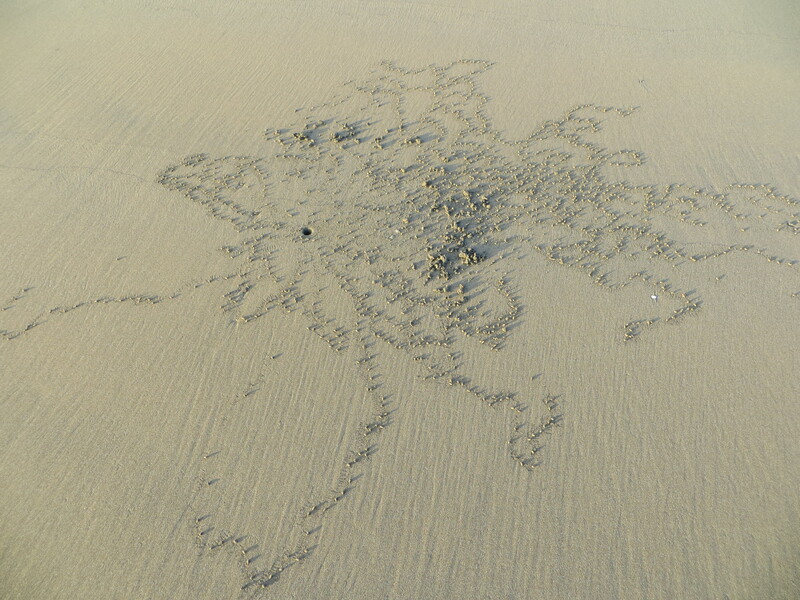 We aren’t sure why, but some crabs leave the discarded sand right next to entrance of their house (little hole) and others scatter the discarded sand all over and form unique designs. We found the designs fascinating and have taken quite a few photos of them. The crabs are very skittish and when they feel the vibrations of your feet pounding the sand as you walk, they run for their houses to hide. If you stand there motionless for a while, you can see them pop in and out checking their surroundings. Eddie managed to get a photo of a crab who couldn’t get to his house in time and played dead. As soon as we backed off a bit, he ran into his house. 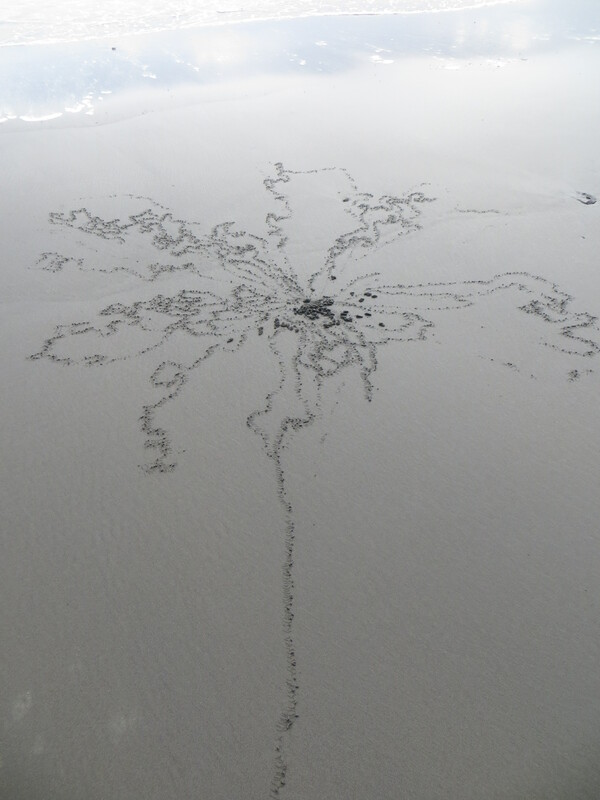 We became very curious about these little crabs wondering what happens to them when the tide comes rolling into shore. 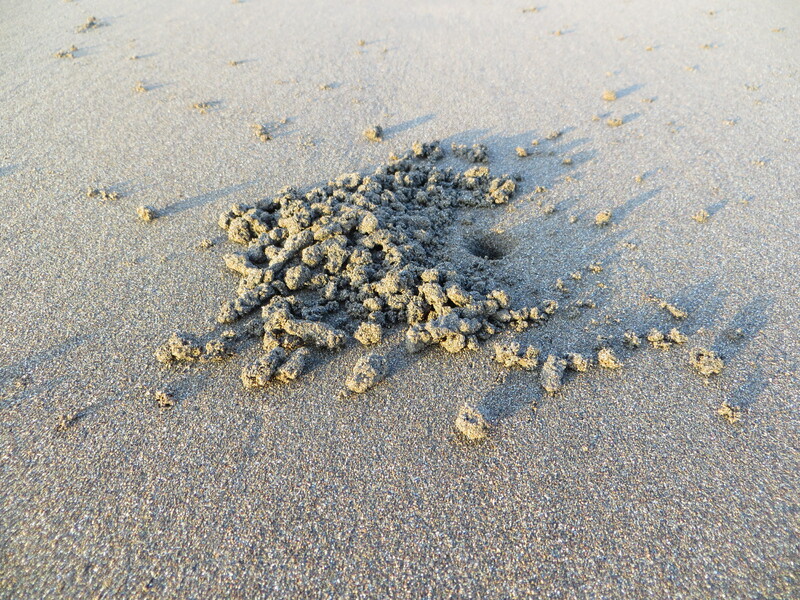 We did a quick search on Wikipedia and here is what we learned: Sand Blubber Crabs live in burrows in the sand, where they remain during high tide. 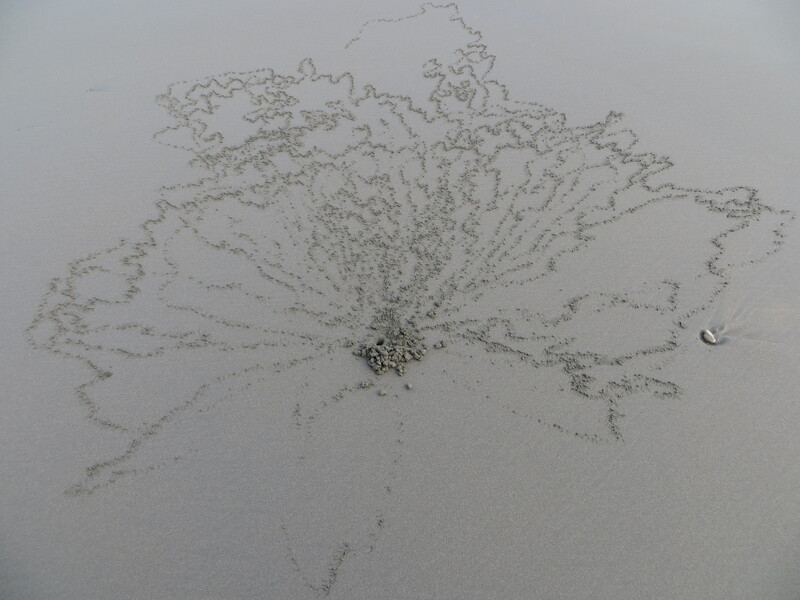 When low tide exposes a beach, crabs emerge from their burrows beneath the sand. They begin feeding by collecting sand and quickly sifting it in search of microscopic food between each grain, inadvertently cleaning the sand. 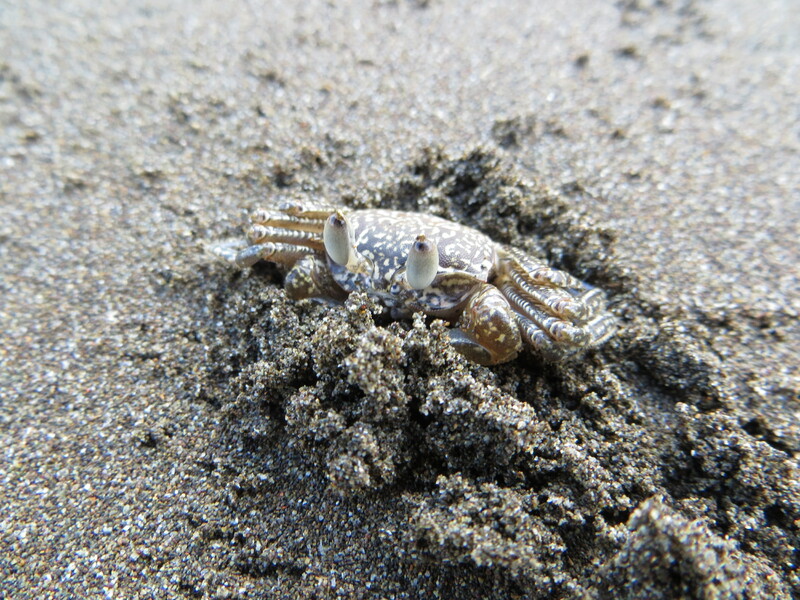 When the sand is stripped of any nutrition, the crab gathers it into a sphere (or “sand bubble”) and tosses it behind its legs.